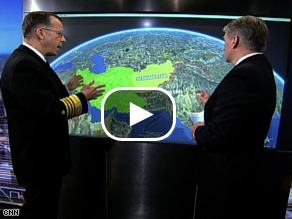 Watch Mullen run down the latest in Iran and North Korea. (CNN) - Iran likely has enough material to make a nuclear weapon, Joint Chiefs of Staff Adm. Mike Mullen told CNN's John King Sunday. “We think they do, quite frankly," Mullen said on State of The Union with John King. "Iran having a nuclear weapon, I believe, for a long time, is a very, very bad outcome for the region and for the world." Tehran has denied pursuing nuclear weapons, and insists the country's nuclear program is for peaceful purposes. Mullen also said he is watching North Korea closely, although he also said he and Defense Secretary Robert Gates have yet to make a recommendation on how to approach that country. "There has been no recommendations one way or another," he said. "There's a lot of focus on this and then recommendations and certainly policy discussions will come based on the timing and what North Korea does." More one sided stories from CNN, run by zionists. Gates has said that Iran is not close to a weapon, every "spy" agency in the US has said they are not trying to build a bomb, but CNN reports "Iran has enough material for a bomb." To bad they need to refine the so called enough material to produce that bomb, and to bad that if they try and do that, that it is a very obvious step. They also have enough material to produce energy / electricity, why not write that? I would love to see a negative story on Israel, you know that ones who can do no wrong to your owner / producers. You guys are zionist sell outs. This time if this country goes into a false war, be sure people will remember that the media , you CNN played a part in it. The same day Robert gates says iran DOE NOT have nuclear tech. CNN and the fascist douche bags say iran does. Who is trying to spin out a war cnn? These hawkish pigs should leave Iran alone, and get out of Iraq and Iran. If any country should have to destroy its nuclear arsenal, it shourld be the Neo-Nazis in Israel. They're the source of war crimes, bloodshed and the nurder of millions of women and children. Hmmmm... Didn't Bush worn us for years that Iran is getting the bomb? Well ye, "the world" tried doing it their way on this issue going back to 2004. But now... T UN and Obama's Pentagon belives that Iran has it. Wow. You think tehran has positive intentions for the region. As far as civil rights go, iran is 100 years behind.